Walk through three-dimensional drawings by Tim O'Brien, Barry Blitt, Chip Kidd, Karen Caldicott, Sheryo, Brandon Cruz and eighth-grader, Jade Lo. Time magazine introduces seven artists to Google’s tilt brush, a program that allows users to create art in a three-dimensional virtual space using the HTC Vive virtual reality headset and controllers. Truly amazing! Interesting to see the different approaches, Jade kills it! Produced by Josh Raab. 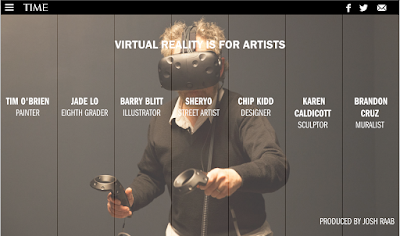 I got the invitation for participating a competition for create art in a three-dimensional virtual space using the HTC Vive virtual reality headset and controllers. I like like this challenges. So i planned to join this event. But i am not ready to challenge with my academics. That is why i used dissertation writing service for buy dissertations. Google Tilt brush change the word of painting and its exceed the level of painting to another level. The technology of Google Tilt brush is amazing. Here i am Share similar helpful information of Reasonable Price Homework Help. i like your post and all you share with us is up-to-date, I would like to bookmark the page so i can come here again to read you, as you have done a wonderful job. Regards planned for penning on the subject of chiropractic medical professional. The merchant will probably genuinely all of us guarantee which type approximately report formulated during that wanted put into practice. You should go along with the check cashing Blended with carryout line document.